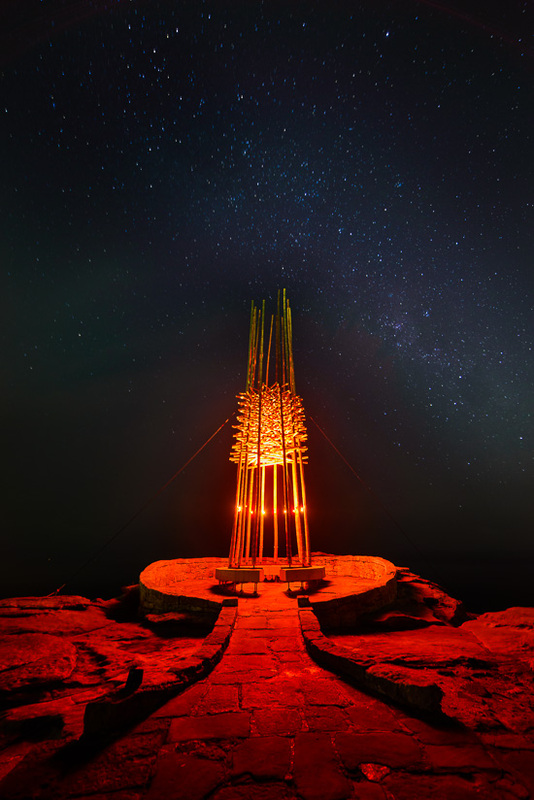 It’s Sculpture By The Sea time again and as with each year it draws photographers from all over to Bondi and Tamarama in Sydney’s Eastern Suburbs to test their photographic skills at sunrise and sunset with these hundreds of sculptures spread out along the coastline. I received a late minute invite from some friends who wanted to shoot sunrise there. I suggested we go an hour earlier (around 4AM – yikes!) so we’d be there two hours before sunrise and do some light painting with the sculptures before twilight kicked in or the mass of early morning photographers and their tripods arrived. I arrived first (just after 4AM) so I headed out to the usual “prime” position right at the point of Marks Park looking out over the ocean to see what was there this year. This is a primo position and there’s usually something reasonably impressive in this spot. It was still very dark in the sky and there were no clouds (or moon) so I figured some starry shots might be on offer. What I found there was a sculpture called “Save our Souls” by the Cave Urban design collective and it’s all lit up internally with some very bright red halogen lights. Tricky for stars but I’m up for the challenge. The milky way was in a pretty good diagonal position to use with this sculpture so I got down close at the edge of the small path leading into the sculpture and shot slightly upwards with my new Samyang 14mm f/2.8 stupidly ultra wide lens. I ended up having to shoot five 30 second(ish) exposures from ISO 100 up to ISO 3200 (at f/3.2) which I then later used some dodgy manual blending in adobe photoshop to put together. I didn’t end up using the ISO 3200 frame but I used parts of all the others. Of course the red light inside the tall sculpture itself and it’s spill onto the ground around it was super bright and was really only exposed well in the ISO 100 shot. I used it and the ISO 400 shot mainly for the sculpture and the ground around it and the ISO 800 and 1600 shots mainly for the sky and stars. 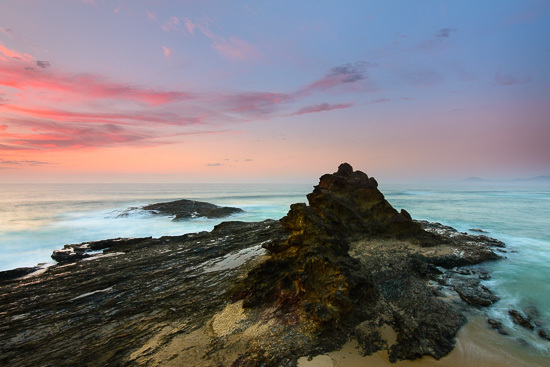 As the sun set over the sleepy coastal town of Nambucca, some colour was starting to appear in the sky. Nambucca Heads is a town on the Mid North Coast of New South Wales, Australia in Nambucca Shire. 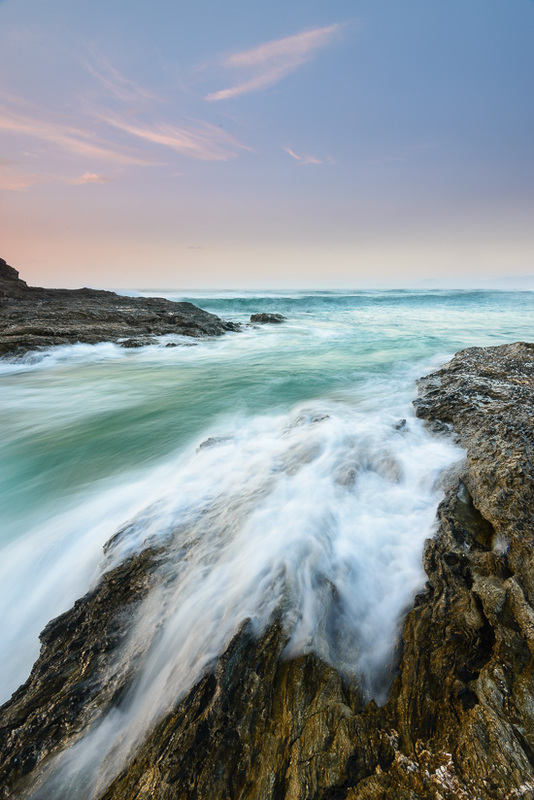 It is located on a ridge, north of the estuary of the Nambucca River near the Pacific Highway, which now bypasses the town. It was time to head down to the water and whilst the soft low contrast light was washing over the scene, put together some frames for a stitched panorama. This iamge is a stitch of nine (9) frames taken with the 24-70 at 70mm with the Lee LittleStopper used to dramatically lengthen the exposures out to 30 seconds for that softer dreamy look. I actually ended up cropping quite a bit off the right side of the full pano – to simplify the scene and remove some distractions. Now that it was light enough to actually see I looked around for some interesting locations and ended up deciding to try and climb the short headland so that I could shoot over the top of both of the rock pillars which thrust out of the rock plates and form Wellington Rocks. Once at the top and the front of the ridge it looked like a pretty sweet spot for some wide panoramic views over the area. I was on a pointed part of the headland so I had uninterrupted sweeping views for about 250˚ from almost north right around to almost west. 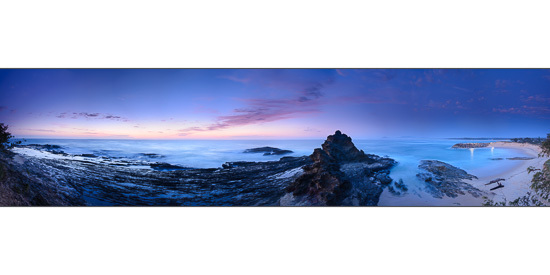 The above is a panorama stitch of ten (10) long exposure frames taken with the 16-35 racked out at 35mm. This was taken before sunrise during twilight with some manual adjustments across the exposures to compensate for changing light – adjusting both shutter speed and aperture a little (between 61 seconds @ f/6.3 to 45 seconds @ f/8). Adding the Heliopan CPL to the 3 stop reverse grad this is a single exposure at 6:17AM and just minutes before sunrise. 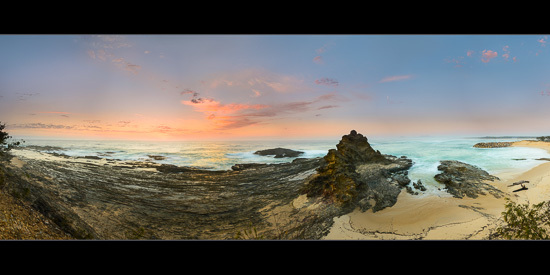 and just after sunrise this seven (7) frame stitched panorama at a wider 20mm. Panoramas done and the sun now risen I moved down to the shadowed side of Wellington Rocks to look for some compositions before the sun rose to high and the hard light set in. 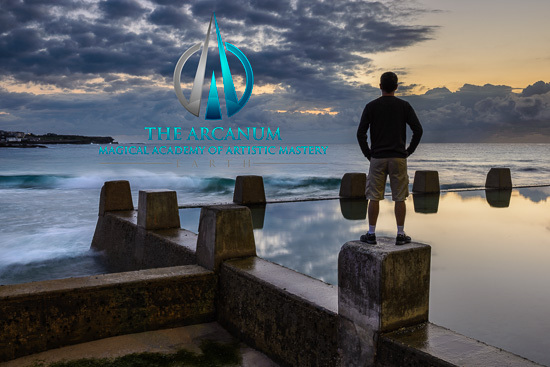 When I met Trey Ratcliff recently on one of his trips here to Sydney we got to speaking about The Arcanum and the potential for becoming a master. My thanks must go to a number of friends who are currently Apprentices in the Arcanum who encouraged me to consider becoming a master and to have the conversation with Trey. I’ve long been impressed with Trey’s ability to “see” the photographic universe and the pulse of the community. He gets it and more than anyone he understands the idea behind community and the value of sharing. So I was inspired by his simple way to end our conversation with “…well… you must apply!”. Literally thousands of photographers have applied for membership into the Arcanum and it’s not going to be an easy task for a Master to sort through such a large and diverse range of applications to craft the ideal cohort group. However if you’d like me to consider you specifically for my Cohort please do update your application, send me a private message and even put my name in your application if you’d like me to find you (we can search by keywords, etc). It’s the start of a whole new exciting adventure…. I’d not managed to shoot the starry sky the night before (the half lit moon in the sky and clouds had conspired against me) so I was hoping a sunrise shoot at the same location would satisfy me. It was just a five minute walk from where we were staying so I set the alarm for 4AM the night before planning for a 5:20AM sunrise and arriving at the location my usual one hour before. What I hadn’t factored in tho was that the change of daylight savings in New South Wales happened overnight so in fact sunrise was going to be at 6:20AM (effectively an hour later). I didn’t really know this till I got to the location and after about half an hour of shooting – thought to myself – man it’s still very dark with no hint of light on the horizon – whats happening with sunrise :). Figuring I probably had a little time to try some starry trails before twilight came in too strongly I headed over to where I’d shot some interesting southward facing test shots the night before. I climbed up the landward rock pillar once again and setup a shot southward over the seaside pillar of Wellington Rock. I knew I didn’t have a lot of time before twilight so I quickly worked out a good exposure for the individual star trails shots (60 seconds at f/4 and ISO 1000) and programmed and started the intervalometer. I figured if I was lucky I might get half an hours worth of frames which I was hoping would be enough to at least give a promise of what might have been given a few hours here in the dark. 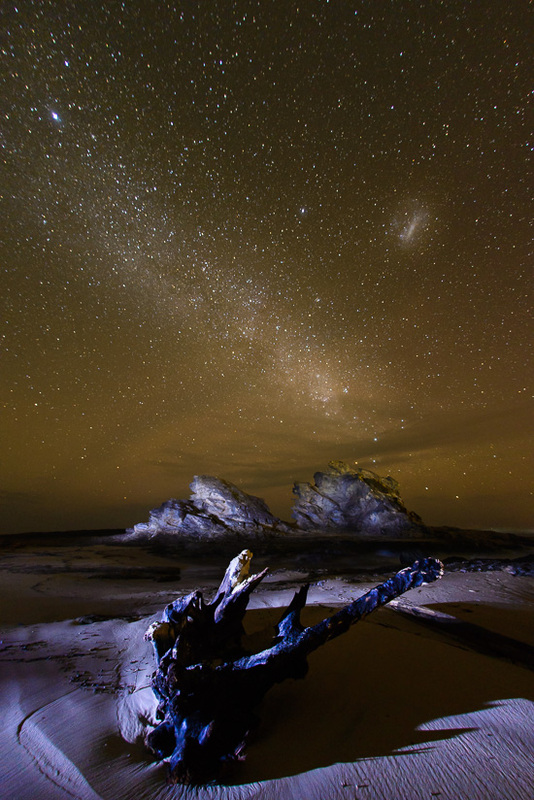 At 5AM when I started the sequence the skies were nice and dark and the milky way was clearly visible. Just over 15 minutes in I could see the sky was getting noticeably lighter so I stopped the sequence – quickly dropped the ISO to 800 and started the intervalometer again. Ten minutes later I again adjusted the settings down to ISO 500. Just after 5:30AM twilight was really starting to show with clearly deep blue skies and fading stars so I stopped the sequence and hoped that the 29 frames I’d taken would be enough to show the starry trails. 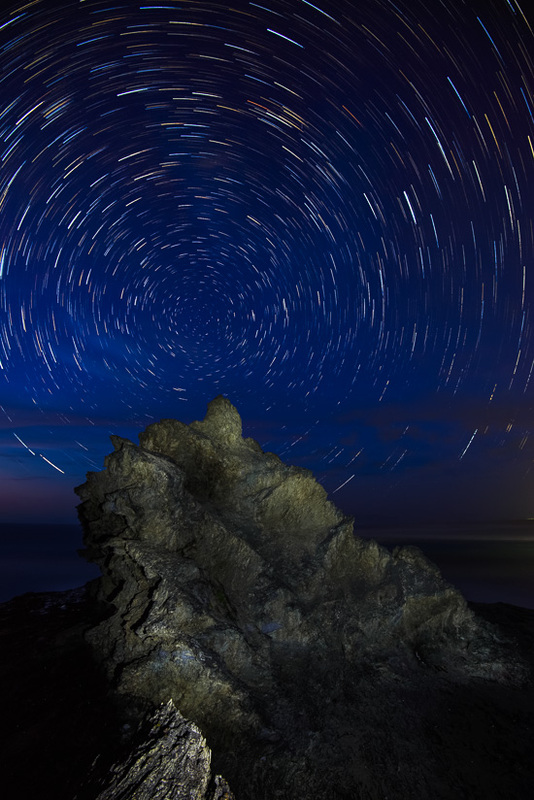 Finally before moving on I did another frame to use for my foreground in the final shot – 61 seconds at f/8 and ISO 400 with some light painting of the rock pillar in front of me. Unfortunately this is where I needed a second person – there is only so far I could reach out from my position to give angled light on the rock. Some side lighting would likely have been more interesting but I was cramped up on a thin ridge on the pillar I’d climbed. I stacked the star trails in photoshop as per usual (see previous posts for the technique) and blended in my foreground light painted layer for the final result. 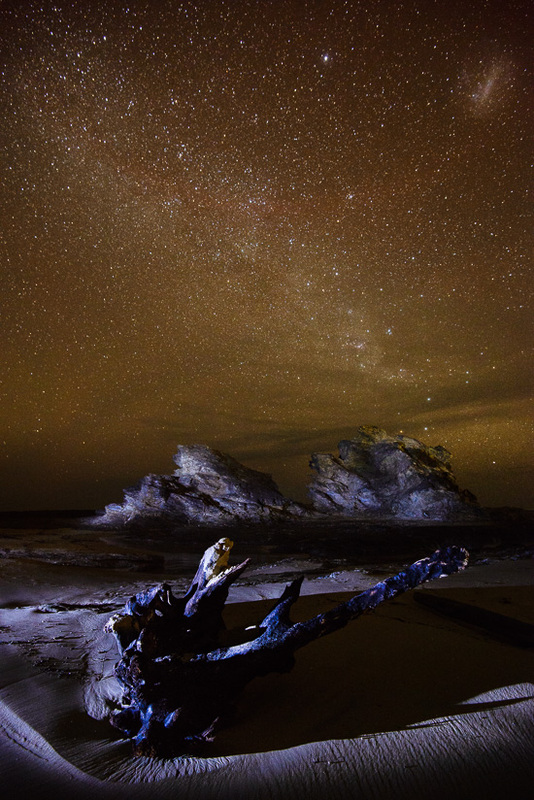 This is a promise of what starry nights could be and a definite reason to return here someday and do the job properly.